The Porsche 917, which was one of the most dominating cars in sports car racing history, was introduced at the Geneva Motor Show, on 1969. It was a new car, built to take advantage of a new set of rules, the FIA implemented in 1969. They stated that, as long as 25 examples were produced, a �sports car� could run up to a 5.0-liter motor. 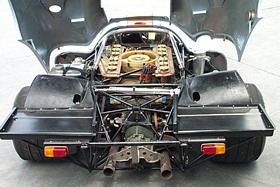 The previous engine capacity Porsche had used was 3.0 liters, which is what the Porsche 908 ran. The 917 went on to win, excepting a couple, almost every sports car race it entered in 1970, and 1971. The record it racked up included: the Le Mans 24 Hours (twice), the 24 Hours of Daytona (twice), the 12 Hours of Sebring (once), along with many of the other FIA Championship of Makes races. The model was also a major contributor to Porsche winning the Championship for Makes title, in 1970 and 1971. At the end of 1971, an FIA rules change made it obsolete, in international endurance racing. Porsche had already thought to convert a normally aspirated, 917 coupe, into a spyder, to run in the �unlimited� Can Am series, in the US. This equated to, basically cutting the roof off of a coupe, and running it like that. In this form it would win the 1971 Inter Series title (this was the European equivalent of Can Am), with Leo Kinnunen driving, while Joe Siffert finished in the top five, in Can Am. It was during 1971, that turbo charging was first tried on the 917 spyder, as the normally aspirated, 4.9 liter, flat 12 power plant could not run with the 8.0 liter, Chevy V-8 powered McLarens and Lolas. The body was also completely redesigned, giving it a shovel nose, and slab sides. A large wing was also added to the rear tail section. These models would be called the 917/10K (the K stood for kompressor, German for turbo charged), which produced over 800hp. It was then further modified into the 917/30, which produced over 1000bhp, and would dominate the Can Am, driven by Mark Donahue, and would set a world closed course speed record, to boot. At the end of 1973, the rules were changed, to again curtail the dominance of the Porsche 917. This would, effectively, mark the end of its professional racing career. The car pictured here, is 917, chassis 026. 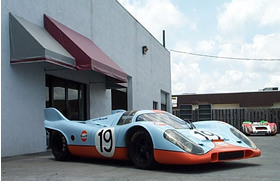 The car was run in 1970, and 1971, by the JW Automotive, Gulf Porsche team, of John Wyer. Wyer had many chassis at his disposal (in all, seven different chassis numbers were used by JW Automotive, with five chassis being replaced with new ones, while retaining the old chassis numbers). Very few of them had a large number of races on them. Tracing the true history of any of the Gulf 917�s is difficult, as the chassis tags were switched around between crashed, and new chassis. The same happened with #026. There is a preponderance of evidence, that this was the replacement chassis for the crashed #026, and that it finished second, at the 1971 Le Mans 24 Hours. The car was, at some point, converted into a spyder, at Porsche. Ernst Kraus then ran the car in the European Inter Series. The process to convert the car into 917/10K configuration had begun, but was never finished. The car ended up in the vast Porsche collection of Vasek Polak, in Hermosa Beach, CA. Kevin Jeannette bought the car form Vasek, in 1988, and brought it to Gunnar Racing for restoration. Over a five-year span, from 1988, until January of 1993, the car was restored to its former JW Automotive, Gulf Oil liveried, glory. 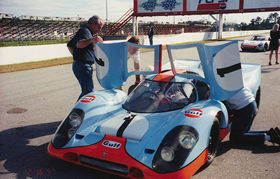 The length of time the restoration took, revolved around the fact that Gunnar Racing was involved in professional racing, in IMSA, at the time. 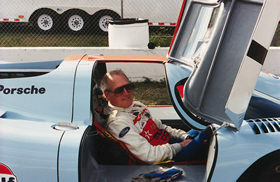 In preparation for the Monterey Historics, in 1998, the tail currently fitted to the car, was added. This is the same style of tail that was on the car at Le Mans, in 1971, when it finished 2nd overall. The car is occasionally run at vintage events, and during private test days out at Moroso Motorsports Park. It will be at the HSR Brumos Daytona Continental Historics, December 1-3, at Daytona Speedway. Porsche will be the featured marquee of the event, and Gunnar Racing will have a large presence there.